Berlin used to be an utopia for contemporary artists. At least to me, I’ve had a clear image of Berlin as a city of art before I moved in and the image had not been ruined even after I started to live here. However the current relationship between Berlin and contemporary art is definitely not ideal. Under this circumstances, a large-scale art exhibition entitled as “Based in Berlin” to introduce Berlin-based contemporary artists created a stir. I would like to explain the present art scene in Berlin for a start and refer to the contents of the exhibition. I’ve been noticing that some small galleries in Berlin started to close this past few years, but not major galleries. However, Haunch of Venison which had shown Damien Hirst and Yoko Ono, closed its Berlin space in autumn 2010 to focus on New York and London. This news casted a dark shadow in Berlin as we started to see the influence of recession. 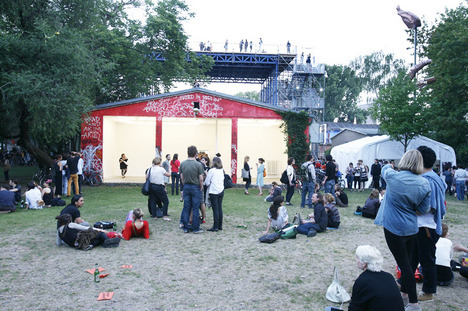 Moreover, as an additional cause, Art Forum Berlin has been called off this year. This contemporary art fair used to gather art related people from all over the world and hold a number of official and unofficial parallel events. As it was one of the biggest art fair in Berlin, the disappointment in art scenes and gallerists were also immense. In the meantime, these bad news are not only about galleries. As well as the Hamburger Bahnhof contemporary art museum, there are many other national museums which hold art work from the classical, the renaissance and the modern period in Berlin. Each museum offered a free entry on every Thursday until summer 2010. It gave a precious opportunity to many artists to see their exhibitions for free. However, all museums discontinued the free entry and we lost an opportunity to see prominent artwork without paying money. Not only the above-mentioned issues about museums and galleries, but also, the increasing rent for studios and apartments and the reduction of available spaces are disturbing artist’s activities and lives. To sum up, the current status of contemporary art in Berlin is in its worst situation ever. Under the existing conditions, “Based in Berlin” theming on Berlin has ignited a furious debate. I should have get to the main subject. 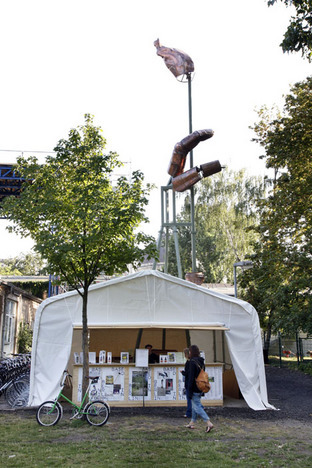 In the first place, this art exhibition was a public art project entitled as “Leistungsschau(Exhibition)” under the direction of Berlin’s mayor, Klaus Wowereit. The plan was released in autumn 2010 with the main objective to deliver a useful overview of the young generation of artists currently living in Berlin and its art movement. However, under the harsh condition of its art scene, this large scale project inquiring a big public funding (about 1,600,000 EUR = 2,300,000 USD according to Zeit Online) became controversial. In January 2011, the opposition members sent an open letter to the mayor on internet with thousands of signatures from supported artists. The letter noted the following criticisms; its “survey of the production of contemporary art in Berlin” is restricted only to young artists and its architectural competition for the venues are obscure. After those arguments, the exhibition title was changed to “Based in Berlin” and the venues were changed to public/private museums and art institutions such as Hamburger Bahnhof Museum, KW Institute for Contemporary Art, Berlinische Gallery, n.b.k.. and a former art school Weißensee Kunsthochschule Berlin’s site. 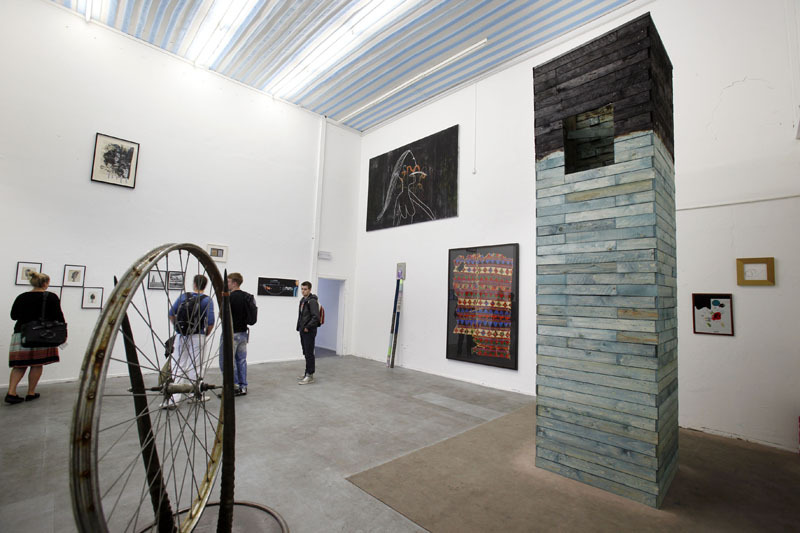 However the show’s main aim was still to show the artwork of young generations of artists living in Berlin. Although this exhibition had a theme, it was narrow and constricted. I’ll introduce some artists and their work which I personally like from the exhibition. First of all, I would like to mention some artists whose work has Berlin’s principal concept; “diversity”. 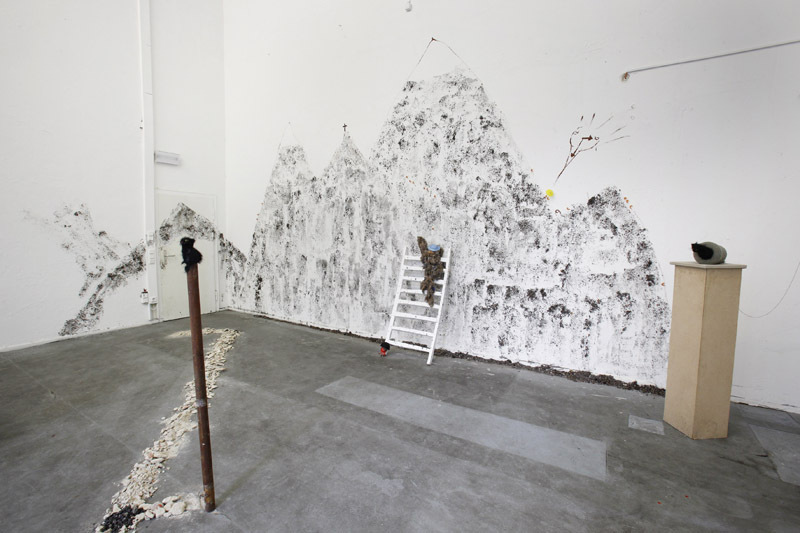 Swedish artist, Erik Bünger showed a humorous video installation “The Allens”. It showed a video clip of Woody Allen speaking continuously to a camera while the computer program switched among different languages in Allen’s dubbing. The tone of dubbing had a diversity and it also changed our set image of Woody Allen. It showed his different set image depending on the countries and also the existence of set image which was different from the original created by the media. This work let us reconsider the fact that the different values from diverse people coexist in this city. 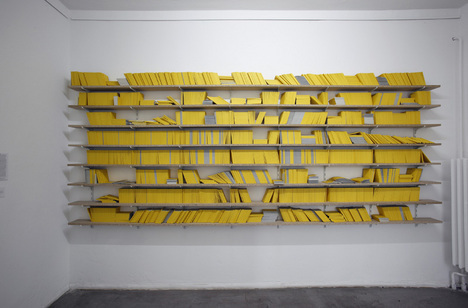 Another Swedish artist, Kajsa Dahlberg displayed a thousand of the same book on a shelf at the hallway of the exhibition space. The design of the book looked like Reclam’s Universal-Bibliothek. These books were copies from Virginia Wolf’s early 20th century pamphlet “A Room of One’s Own” which the artist collected from the libraries in Berlin and put them together. It contained various marginal notes and underlinings written by many readers. It had a diverse point of view about this particular book and showed the possibility that a book could create various thoughts. >There are many Turkish immigrants living in Berlin. They deviate from tradition and create a peculiar new culture. Turkish artist, Köken Ergun’s three-channel video installation showed the change of culture by projecting a documentary of over 40 wedding ceremonies in the Turkish community in Berlin. The video revealed the realistic giving and taking which happened during the flamboyant wedding rituals. For example, the guests paying cash as a wedding gift at the center of the hall and a DJ announcing the name and amount of the gift while the another screen showed the wedding guests dancing happily. It also showed how traditional ceremonies and rituals have been transformed to hybrids. The modernize form of rituals might be showing the light and shadow of cultural development at the same time. The above-mentioned three works have a point in common. All three are created by foreign born artists and reflect what diversity should be. There are 440,000 foreigners from 180 nations in Berlin. The ration of foreigners is more than 10% of the populations. They bring their cultures to Berlin and create hybrid cultures and diversity. However diversity does not depend on only nationality. It is also caused by individuals with different ideas and live together as a constructive element of the whole. This idea gives us new vantage point to think about how each identity should be while the world is globalizing. Second, I would like to introduce some artists whose theme is the relationship between an artist and Berlin. 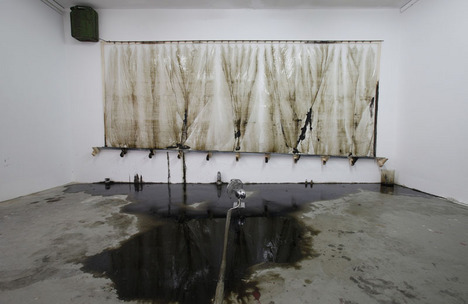 Cyprien Gaillard is an established French artist. He participated in Aichi Triennial in 2010 and he received lots of attentions for this year’s solo exhibition at KW Institute for Contemporary Art in Berlin. As a project of the DAAD’s Artists-in Berlin Program in collaboration with “Based in Berlin”, his work was displayed in the middle of July near Alexanderplatz Station. 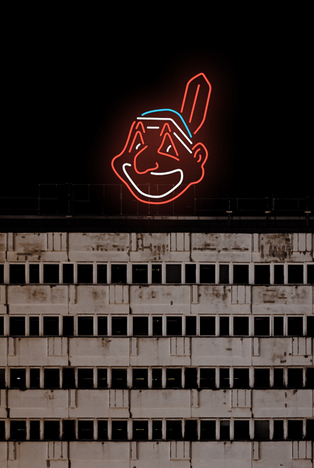 Gaillard exhibited a neon sign of the iconic mascot of the US baseball team Cleveland Indians; a native American cartoon caricature at a top of a building. The neon indian which is detached from the original context of the US baseball team competed with the surrounding advertisement in the middle of Berlin and showed a true picture of the city from a side view of the consumer society. Vietnam artist, Akim covered the main exhibition space with graffiti and scraped the graffiti off with the wall itself. However his graffiti traces remained and we could see the process of his activity. At a first glance, it seemed meaningless but it recalled us the cycle of graffiti process; painting graffiti and being erased. His work is not only graffiti but also reflecting his artwork to everyday activities in the city. It let his viewers realize that the city is changing through the ordinary process. The work of Dahm Vo, a Danish citizen born in Vietnam, was a replica of the Statue of Liberty. For this exhibition, he displayed only the part of her right hand with the torch on the information center at the main exhibition space. However the hand has only the bone structure and the tip of the torch and only two fingers are visible. The original Statue of Liberty is a symbol of freedom, but on the contrary, Vo’s replica suggests the meaning of freedom in an ironic way. As a refugee from Vietnam, the meaning of freedom and Vo’s personal background has a connection. He shows one of the world’s famous landmarks stripping the primary message and let his viewers to rethink the meaning of which the original has. These three pieces of artwork expose a reality of Berlin as a metropolitan showing through the graffiti, consumer society, and landmark. People who seek freedom, expression and pleasure gather in Berlin and accelerate its chaos with enormous energy. I think that these works criticize Berlin in an ironic way. 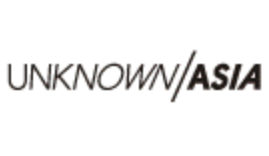 “Based in Berlin” also has a concept to introduce emerging artists. Most of above-mentioned artists are already represented by famous galleries and their work is high quality. There are some emerging artists whose work is still incomplete but has potential. 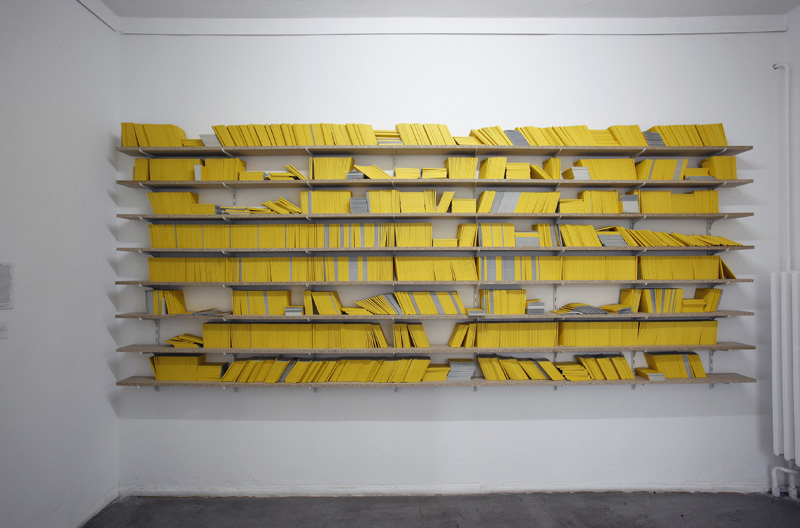 Yorgos Sapountzis who questioned an essence of sculpture by creating three-dimensional work with performances and videos. Rocco Berger who asked what painting should be using an automated painting machine. 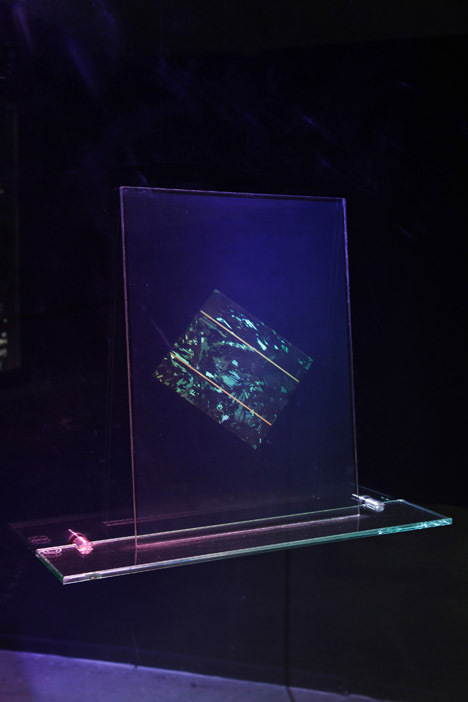 Aids 3D who exemplified our perceptions of view by their 2D hologram work which rendered 3D images. The work of these three artists showed their potentials and gave me an impression. 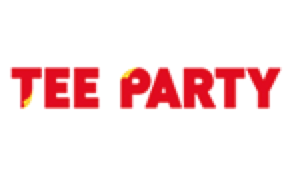 However, I couldn’t find their connections to Berlin. The best characteristic of this exhibition was the participation of alternative spaces such as Autocenter, PMgalerie, Galerie Im Regierungsviertel and after the butcher. 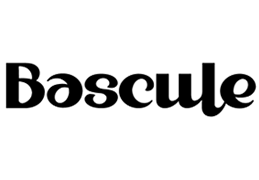 Each space showed several artists, but their names were not announced as official artists for “Based in Berlin”. The space itself was listed as an artist like a nest. Autocenter, founded in 2011, had an outstanding exhibition among the four. 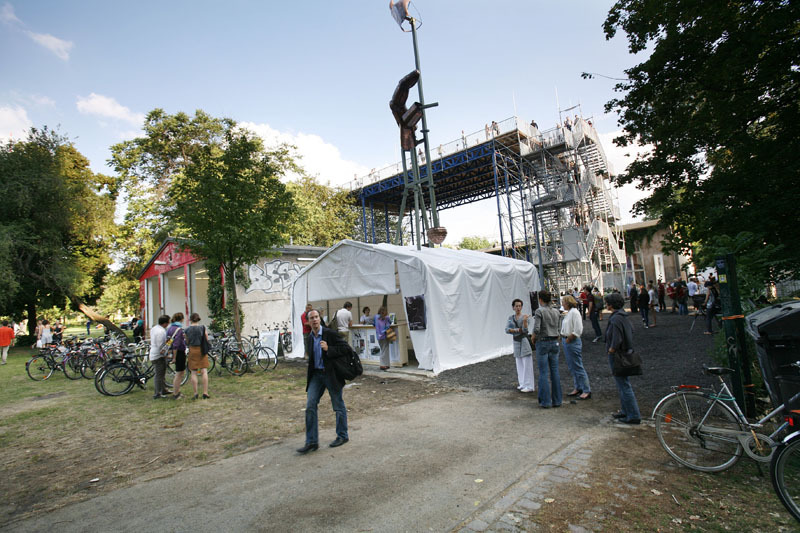 Following several shows, it moved in to the main exhibition venue and continued its own program as part of “Based in Berlin”. They introduced various emerging artists without limitation and showed their work instinctively and spontaneously. Their straight way of showing artwork gave me a glimpse of the future of the art scene in Berlin. “Based in Berlin” introduced over 80 young artists and art spaces residing in Berlin. Moreover countless artists were exhibited at the alternative spaces. The official events, concerts, performances and lectures were held almost every day. 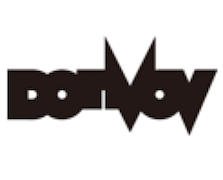 I believe that It must be an unthinkably massive and obscure project. However, it was hard to find a point in common other than “young” and “Berlin-based artists”.The majority of the audiences might be able to catch a glimpse of Berlin’s current art scene in fragments. This chaotic state is a true picture of Berlin. In a sense, the diversity which Berlin has is coming from its chaos without a boundary. I could say that this was very Berlin-like exhibition. 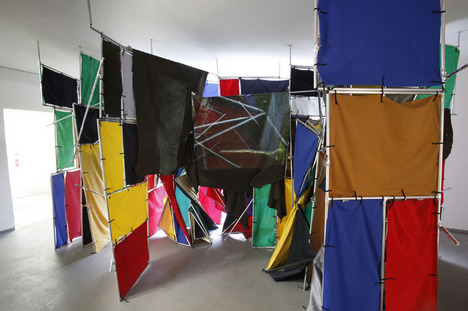 However, what did this chaos bring to today’s rigid art scene in Berlin? In a way of highlighting young emerging talents, the exhibition is succeeded in showing the future possibilities of Berlin. But the artists who were selected without specific theme or definition made the exhibition more confusing for the audiences. A possibility without significances and directions just keep emitting energies and never became a reality. What I saw in the exhibition was a chaos reflecting present Berlin, not a “future” which contemporary arts can essentially show. Many artists in Berlin were seeking a “future” from this exhibition because they have been asking for founding a contemporary art museum in the city. People wanted to have not only a temporary art exhibition but a permanent art facility. To respond people’s desire, the directors tried to make “Based in Berlin” as a place to discuss a consideration about building a museum. However what we actually found from the exhibition was only a chaos in the “present”. As an art-related residence in Berlin, I believe that what this city really needs is a “future”.